We’re doing our part to help consumers shop. Our nation’s economy is facing a severe recession and as well-known entrepreneurs, with a national following, we are hearing horror stories from other businesses across the country. Record $133-a-gallon gas has forced consumers to slam on the brakes; they are not driving and they are not shopping. 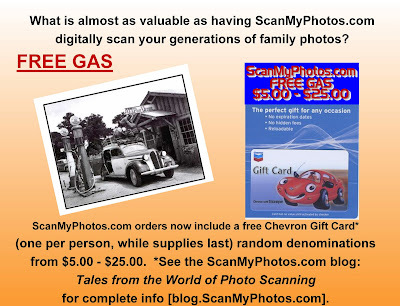 ScanMyPhotos.com has established the free gas program to help incentivize other ecommerce and traditional retailers to use Chevron Gas Cards as an innovative way to get consumers back in their cars. For our Southern California retail customers, ScanMyPhotos.com is showing its appreciation for supporting businesses during our nation’s economic energy crisis. We already have the lowest, most innovative photo scanning services in literally, the world. 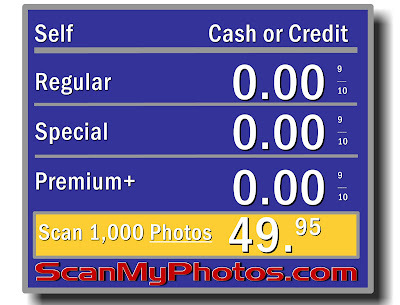 ScanM yPhotos.com pioneered super-fast and affordable photo scanning. And, we are regularly launching creative marketing programs to support commerce and important issues. For our prepaid and mail-in photo scanning orders, we want you to also share in this program. Look out for your own Chevron Gift Card, (one per customer) valued in denominations from $5.00 – $25.00, while supplies last. Click here for helpful information and requirements.